1 x X500 2.4G 6 Axis 3D Roll FPV Quadcopter (Black). 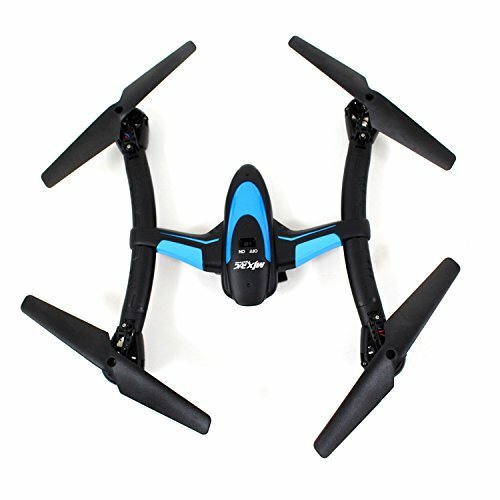 Description: 2.4G â€ 6-Axis Gyro Quad-copter.Â The quad rotor designÂ ensures stable and powerful performance, and makes 3D action easier. Headless Mode and One Key return are also available. The newly designed structure makes assembly and maintenance easier. Adopting 2.4G auto connection technology, scores of quad-copters can be played at the same time.Â. Features: FPV (Not Included). #C4002/#C4005 Camera (Not Included). Headless Mode. One Key Return. Searchlight. Throttle Limit Button. Left/Right Throttle Control Switch Mode. Package Contents: Manual. Remote. X500. Spare Propellers. ScrewdriverÂ. Guard. Battery included. Product Size: 7". Recommended Age:Â 14+. Item Code:Â X500 Black Size: 13 x 4 x 18 inches.